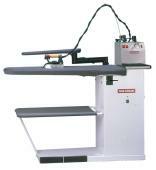 A vacuum board is a professional ironing table that has a heated pressing surface and a motor. Stepping on the pedal activates the motor, which creates vacuum on the pressing surface to remove moisture from the garment. By cooling and drying the garment with vacuum, you “set” the press, and the garment stays pressed and crisp. 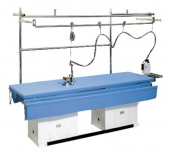 You no longer have to run the iron back and forth to dry the garment, thus saving you time, and preventing shine as well as wear on the fabric. A blowing board is a vacuum board that gives you the option of switching the air flow from vacuum to blowing upward, so that you can press garments on a cushion of air. Pressing garments on blowing air is gentle to the fabric (perfect for delicate garments), prevents shine on dark-colored fabrics, and allows you to finish garments without making seam impressions or pocket impressions.